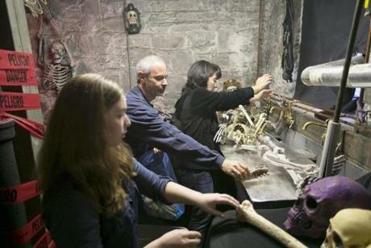 Dan Barrett adjusted a skeleton on a wall while setting up a room in the haunted house. NEWTON — A squad of elite fear specialists will descend into the slightly musty basement of a Victorian house Friday night to take up haunting positions. Their preferred instrument of terror? Insights from the science of emotion. The monsters and ghouls in this unusual haunted house are Northeastern University psychology researchers who spend their days generating emotional responses in the laboratory, to probe what’s happening in the brain when people experience visceral feelings. The haunted house experience of frightening children and adults — and observing their reactions — has helped the masked scientists sharpen ideas for research questions to test back in the laboratory. People respond powerfully to uncertainty, research has shown, so in this haunted house the monsters hold still as long as possible to prolong the doubt about whether they are alive or not. Experiments have also shown that we pay close attention to the whites of people’s eyes, which can convey fear, said longtime skeleton and postdoctoral researcher Maria Gendron. 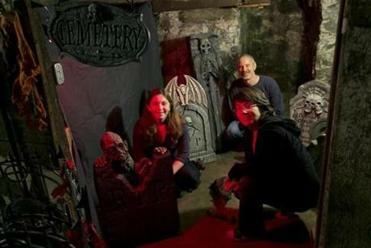 Psychology professor Lisa Feldman Barrett — shown with her daughter, Sophia, and husband, Dan — started the haunted house tradition at her home at the suggestion of her daughter. The event also serves as a fund-raiser for a food bank. “You open your eyes really wide and follow the person with your eyes, and then eventually when they’re sort of sure that you are animate, at that point you do a very subtle movement,” she said. The annual haunted house — the scientists sometimes refer to it as a “fear induction” — is a charity event that raises more than a thousand dollars each year for the Greater Boston Food Bank. Like any experiment, the haunting has been tweaked since psychology professor Lisa Feldman Barrett started the tradition at her home nine years ago, at the suggestion of her now-teenage daughter, Sophia. “We used to do a lot more conventional things, like jumping out at people, loud noises, things like that — things that would startle people,” Barrett said. They refined their approach based on insights from neuroscience and psychology: “You have to get the nervous system into a state of arousal in order to have the maximum effect when you deliver a fearful stimulus, and so that’s pretty much what we’ve learned to do,” she said. There’s still spooky music and monsters who jump out, but the scientists try now to engineer a building sense of creepiness as visitors progress from the bone room to the graveyard. For example, in the mad scientist’s lair, a human head on a platter slowly comes to life and desperately mouths the words “Help me,” something that Barrett says causes viewers to experience “simulation” — the feeling that they, too, are in distress. Barrett’s laboratory doesn’t specifically study how to scare people. In fact, human beings have a pretty good intuition for how to creep each other out: haunted houses, horror movies, and spooky stories haven’t needed scholars’ insights to elicit shrieks of fright. But the haunted house gives researchers an interesting way to generate and witness emotions outside the lab — sometimes reinforcing their own findings. The Barretts prepared a room of the haunted house. The Northeastern team has shown that facial expressions, which have long been interpreted as a readout of internal emotion, are far more complex and are highly dependent on context. That’s on display as the ghouls watch their victims proceed through the maze of rooms. Barrett said that speaking to people about their experience in the haunted house raised another question: She found that people vividly remembered certain rooms or certain monsters, which made sense. Yet incidental details were also strongly imprinted in their memories. She wondered whether a part of the brain, the amygdala, classically thought of as the fear center, could be important for neutral memory and began to design experiments. The early results, she said, are backing up the observations from the haunted house. Suzanne Oosterwijk, a former postdoctoral researcher, said the haunted house was more than just a fun time — it put on display a behavior that she had long been interested in: the ways in which curiosity can draw people toward things that disgust or repulse them. Now a researcher at the University of Amsterdam, Oosterwijk recently received a grant to systematically explore the behavior and try to understand the dynamic way in which people respond to negative experiences, sometimes seeking them out. The biggest value of the experience of playing scary monsters for one night may be that it builds social bonds crucial for science to work. The haunted house will be held Friday, Oct. 25, from 5:30 to 8:30 p.m. at 18 Washington Park, Newtonville. A visit costs $5 per person.